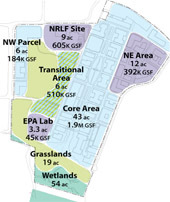 The massing study presents two alternatives to accommodate off-campus research needs of the Lawrence Berkeley National Lab and the University of California, Berkeley. Both alternatives present an open space framework to create a sense of place and orientation as well as to capture and treat storm water. 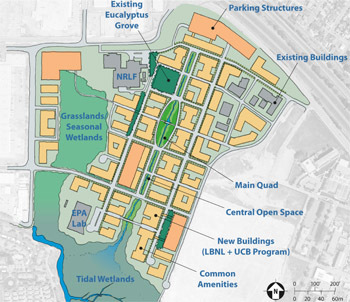 Primary stands of vegetation, wetlands, and existing uses to remain are integrated into the plan. The plan’s capacity is approximately 3.6 million gross square feet of space in a mix of three to five-story buildings for the estimated 12,000 population of users.